Volunteers of America's Eviction Prevention Program stabilizes resident families and individuals living in Louisville Metro Housing Authority properties by preventing evictions through financial assistance, crisis intervention, mediation, and collaborations with other service providers. Recognizing the value of short-term assistance in preventing the long-term cycle of homelessness, the Eviction Prevention Program provides immediate financial assistance and crisis intervention. Volunteers of America's Unity House provides safe emergency housing for families who become homeless due to a wide range of factors. The shelter's hallmark is a commitment to serving the whole family in one location. The program also provides individualized case management, housing placement, and other services to help families transition back to the community and become self-sufficient. The Family Stabilization program serves families and individuals who are homeless or at risk of homelessness. We provide case management and support to these families by managing crisis situations and offering solutions and referrals as appropriate. We help them set goals and meet those goals so that ultimately we can ensure that families are preparing themselves for self-sufficiency and are able to successfully live on their own. 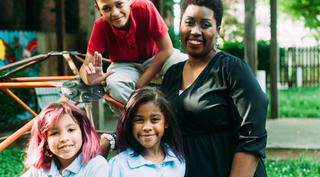 Recognizing the need to build a bridge between homelessness and permanent housing, the Transitional Housing Program offers families a place to live for up to two years after leaving the Volunteers of America Mid-States's Family Emergency Shelter, as well as case management and housing placement services. Volunteers of America provides permanent, safe, affordable housing for low-income seniors and to low-income persons with severe mental illness. Although residents live independently, community rooms, regular activities, and on-site staff provide opportunities for socialization and help facilitate a support network among residents.